Rather than an app, there is a link to a YouTube video describing how screen printing really works. This is totally different from how most people think it works. 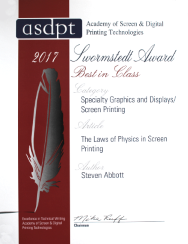 It was a victory for science that my article in Specialist Printing The Laws of Physics in Screen Printing won the ASDPT Swormstedt Award in 2017. 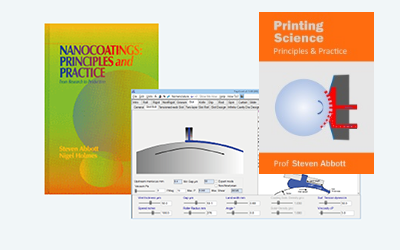 It has been a long journey trying to persuade screen printers that physics is their friend and not their enemy! The symbol of screen printing is the squeegee, so it came as a shock to the industry when I wrote an article in the screen printing press saying that the squeegee had nothing to do with the screen printing process. The article became widely circulated (and debated), but never refuted. This is because it is irrefutable via a simple argument. The squeegee is, of course, important for filling the mesh when it is in contact with the substrate and for scraping off any excess - in other words, setting up a controlled amount of ink in the mesh. But at the point where the printing is about to take place, the squeegee is pressing the mesh against the substrate so no ink can be transferred. Only when the squeegee is many cm away from the printing area can the mesh rise and the printing takes place. So the squeegee is long gone - it has nothing to do with the actual printing. Another myth is that the ink comes out of the mesh - and people wonder what causes the ink to come out of the mesh. In fact, it's the other way round: the mesh comes out of the ink. And just as no one says "How does a spoon get out of a jar of honey?" so there is no point in asking "How does the mesh come out of the ink?" It just does. What else can it do? The really interesting thing is what happens when the mesh comes out of the ink. My colleagues at U. Leeds, Prof Kapur and Prof Gaskell, and I worked out the theory of what must be happening. And the theory makes a surprising prediction. If you ask a screen printer to draw the ink immediately after the mesh has gone, they show little piles where the holes in the mesh were and little gaps where the mesh was. This is intuitive, but wrong. In fact the largest thickness of ink is exactly underneath the mesh. This is trivial to prove with a few microscope images, but people don't like doing the experiment because it goes against their dearly-held beliefs. Why does this matter? Because once you understand how the process works, many mysteries disappear and you can set things up properly. This page isn't the place to describe the whole story. Happily the book I co-authored with David Parker, Anna Harris and Tricia Church when I was at MacDermid Autotype describes it all: How To Be A Great Screen Printer. I am grateful to MacDermid Autotype for their permission to provide the download from this site. But to give you a taste for what's involved, have a look at this video where I use the Screen Print Animator tool (which I authored at MacDermid Autotype) to show what is going on.